is the story of Annemor’s own personal experiences while working at the recycling mill Torridal Tweed near Kristiansand, Norway. Worn knitted wool rags were stored in a gigantic pile while waiting to be shred into the raw material for shoddy. When Annemor took over the factory, she inherited 16 tons of rags and sorted out about 3000 different garments, which, for one reason or another, she found interesting. In the beginning, Annemor only cut out patterns which she thought would be useful for teaching. Gradually she discovered that entire garments were also a treasure, and started saving as many as she could. Annemor received a grant from the Norwegian Council of Culture to sift through the entire rag pile in the old storage room. In the beginning she had no idea what she was looking for, or what she would find. However, the sorting process turned out to be a treasure hunt in knitting history, from the near past to roots in exotic and faraway civilizations. This is a treasure trove of knitting patterns and cultural history. The author unravels the fascinating history of traditional knitting, a story revealed by investigations in a pile of knitted rags left behind in the storage bins of a ”shoddy” factory. 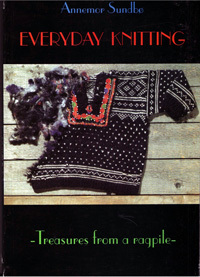 The rag pile reveals the close historical ties between everyday knitting in Norway and traditional knitting in Europe. Everyday Knitting provides a glimpse of creativity in the everyday life of knitters. Anyone with a genuine interest for knitting is sure to find a wealth of inspiration and ideas. Charts and patterns give advice on how to develop your own patterns from traditional motifs. This is an unusual book for creative readers with cultural interests.